Hong Kong is packed with people. There are 6 million crammed into a city that mostly sits on a piece of real estate no bigger than Manhattan. Mongkok is where the crowds come to a head. According to the Guinness Book of Records, Mongkok is the most densely populated place on the planet. It squeezes in over 130,000 people per km2. Mongkok means busy corner in Cantonese, and it is just that. 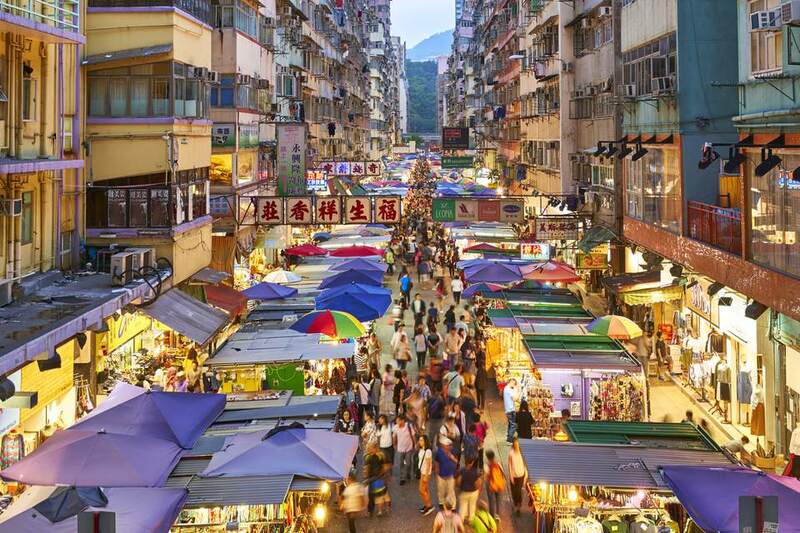 Once the headquarters for the notorious Hong Kong Triads, this is now one of Hong Kong’s liveliest districts jammed full of shops, street side stalls, and Hong Kong’s famous Mongkok Ladies Market. Take our tour of Mongkok Ladies Market to get a slice of the real Hong Kong, and possibly a bargain as well. 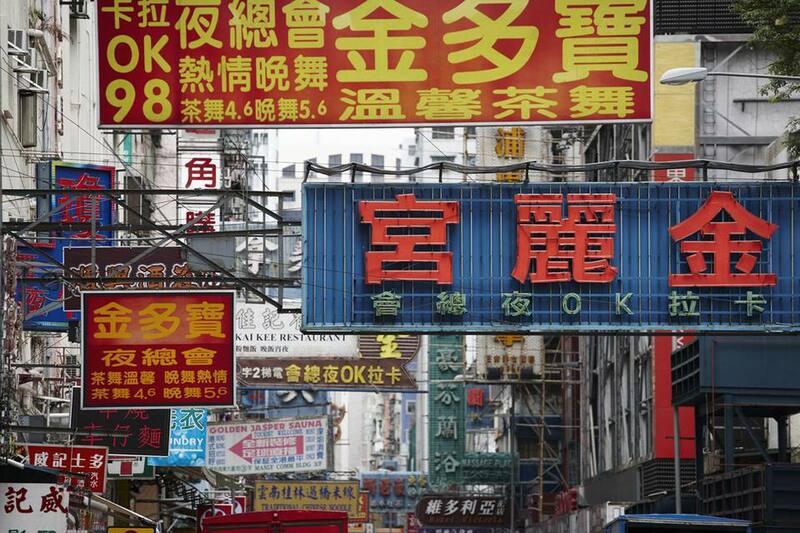 Mongkok Ladies Market is Hong Kong's most popular market, and still one of the best. You'll be told it's a tourist trap, and it is, but that doesn't prevent it from being one of the most entertaining trips in town. The color, the noise, and the atmosphere make it more like a carnival. And it still does a great line in bargains. Most of what's on sale is cheap clothing, from T-Shirts to Cheongsams, although chess sets, chopsticks and other Chinese themed gifts are also popular. You can find the Ladies Market between Boundary Street and Dundas Street on Tung Choi Street. Time to dust off those bargaining skills. All prices at the Ladies Market are negotiable, and the sellers will waste no time in trying to fleece naïve tourists. Assume everything is at least 10% overpriced, if not 20%. Start at a low price and bargain with the stall holder until you reach a price you think is fair. If they won’t budge, take your business down the road as the same or similar product shouldn’t be far away. Be warned, Hong Kong market sellers are old veterans and can appear aggressive, but the bargaining is just part of the game. In fact, if you get a good price, they will often offer you a compliment ​afterward. Try some Hong Kong shopping tips for more information on how to get the best out of shopping in the city. Hong Kong is flooded with fakes, or copies as they are known here. From handbags to teabags, everything is produced in China, shipped over the border and sold at rock-bottom prices. Fakes and copy products at Mongkok Ladies Market are on offer openly. We don’t endorse buying copy produce, and if you do purchase something dodgy then you’ll have no recourse if something goes wrong, and it often does. The main copies on offer at the Ladies Market are fake watches or fake handbags, both of which can be made to order. However, remember what you are doing is illegal and raids at the Ladies Market are rare but not unknown. You won't be arrested, but expect to have the merchandise and your money confiscated. For something more exotic, just up the road—on Tung Choi road—is the Goldfish Market. Here you'll find multicolored fish, snakes, spiders and other creatures from the jungle on sale. Hong Kong’s streets are lined by street-side food stalls, known as dai pai dongs, and if your gifts for the troops back home have been purchased, refill at one of Mongkok's fantastic street stalls. From congee to fish balls in chilli sauce, food is fast and tasty. Don’t worry about trying to negotiate a menu, just pick and point. Prices are generally between $1 and $2 for each item. For refreshment try one of the nearby juice stalls, which will squeeze any selection of fruit you ask for into the perfect thirst quencher.